ECHINODERMATA : SPATANGOIDA : Loveniidae STARFISH, SEA URCHINS, ETC. 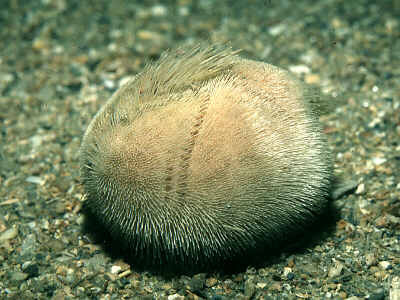 Description: This heart urchin has coarser, more regularly arranged spines than other species of Echinocardium. The frontal ambulacrum is flush with the front of the test. This species is critically separated from Echinocardium flavescens by the short labrum and the absence of larger spines in the interambulacral areas of the upper side of the test. Up to 7cm in length. Habitat: Lives buried in coarse gravel and sand mostly in the sublittoral region, common intertidally in the Channel Isles. Distribution: Recorded from all round the British Isles apart from the North Sea coasts. Similar Species: Most likely to be confused with other Echinocardium species. Heart-shaped test with anterior ambulacrum not indented. Short labrum, not reaching second pair of ambulacral plates. No larger spines in the interambulacral areas of the upper side of the test. Picton, B.E. & Morrow, C.C. (2016). Echinocardium pennatifidum Norman, 1868. [In] Encyclopedia of Marine Life of Britain and Ireland.